← A+ for taste. That’s right, A+! Some friends and I took advantage of the amazing weather on Sunday and ventured to the South Hills for the highly recommended, Casa Rasta experience. 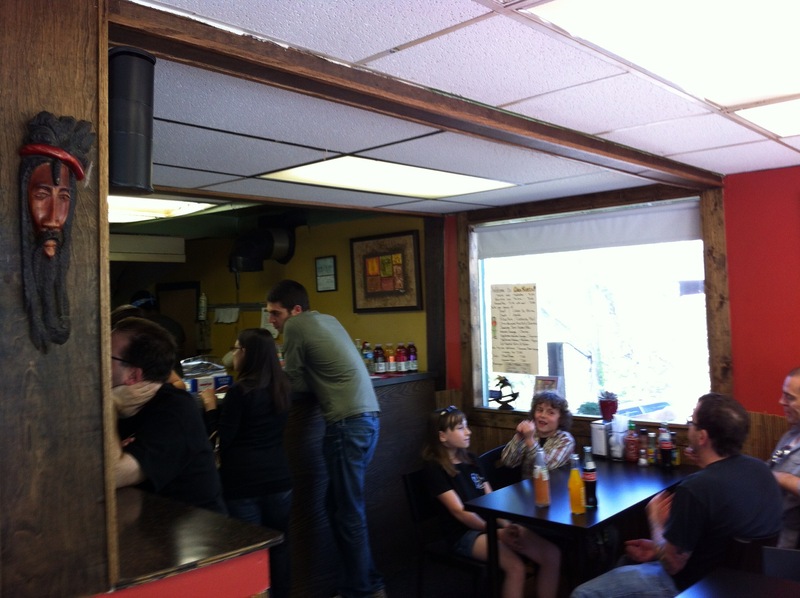 It is a cute little place with a nice outdoor patio. Prefect for a lazy Sunday afternoon of sunshine, people watching and chowing down on some good grub. The inside has just a few seats, so be warned if you are going on a cold or rainy day, it might be best to get yours to-go! There are two veggie tacos on the menu. I clearly had to try both! They were both good. Not earth-shatteringly good, but good. Both tacos came with two fresh corn tortillas. Yum! 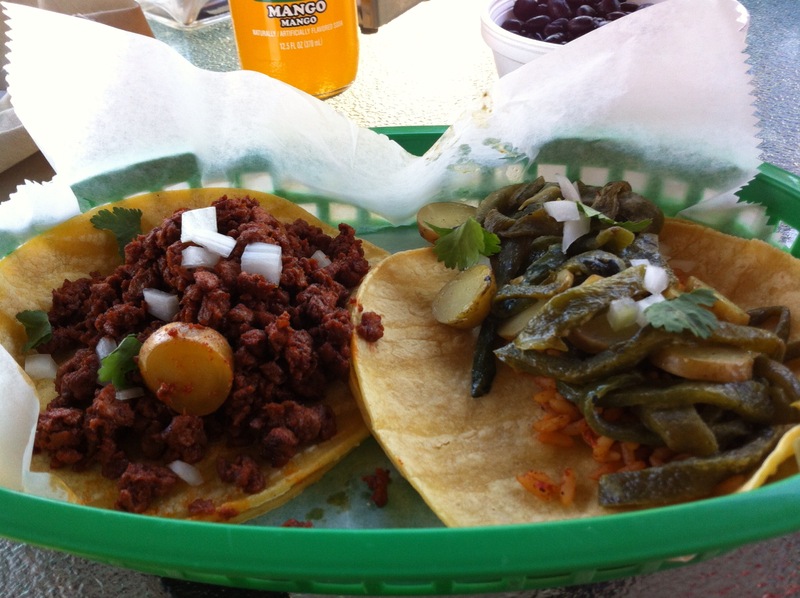 The first one I tried, which was my favorite of the two, was the Vegetarian Poblano Chilis & Potatoes (Rajas) and the other was a Vegetarian Mexican Sausage (Soyrizo). The pepper one was cooked well and didn’t have any of the bitter/metallic taste that happens sometimes to cooked peppers. The peppers were cut into ribbons which made for a fun presentation. Topped with a bit of their homemade salsa, it was a good taco. The Soyrizo taco was fine. I ate the whole thing and enjoyed it, but it tasted like something I could whip up a home in no time. The “sausage” tasted just like Boca or Quorn crumbles cooked in some taco seasoning. I liked it, but it was nothing special. Am I glad they have it on the menu though? Heck yes! I will always credit a place when they have veggie protein on the menu! Well done, Casa Rasta! 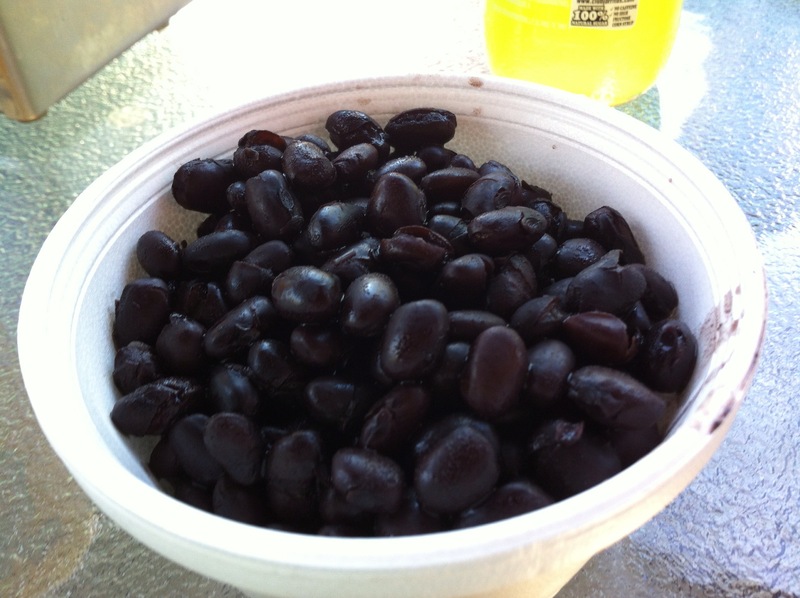 The only thing on the menu that I didn’t much enjoy were the black beans. They come in a Styrofoam bowl, which for a cute little hippy, veggie/earth friendly place, I was shocked that they used Styrofoam. But neither here nor there, the beans were just not great. No seasoning and a minute or two undercooked. I put them on both tacos to add a little somethin’ somethin’, but on their own, they were not good. 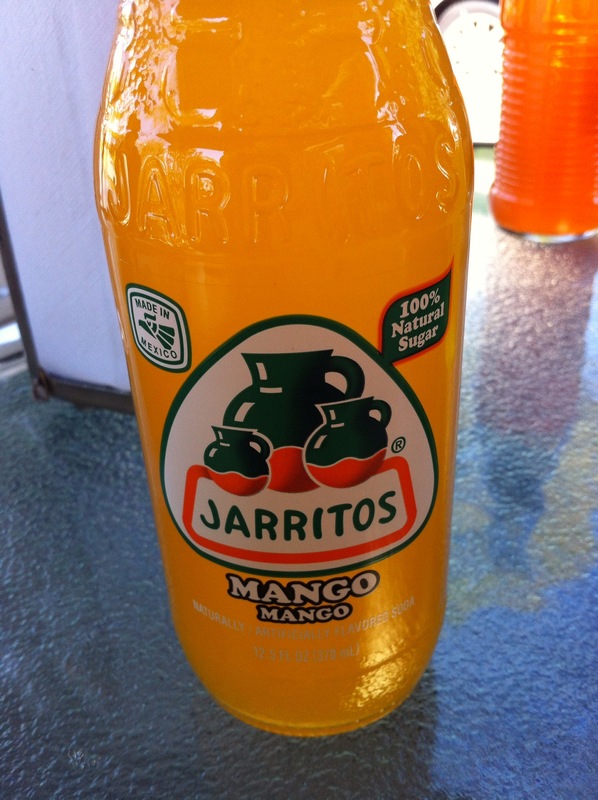 I did, however, very much enjoy my Mango Jarritos. Delish. If you have read my review of Smoke and this one, I bet you can guess my winner. For the food, from this one veggie’s perspective, there is a clear winner- Smoke. 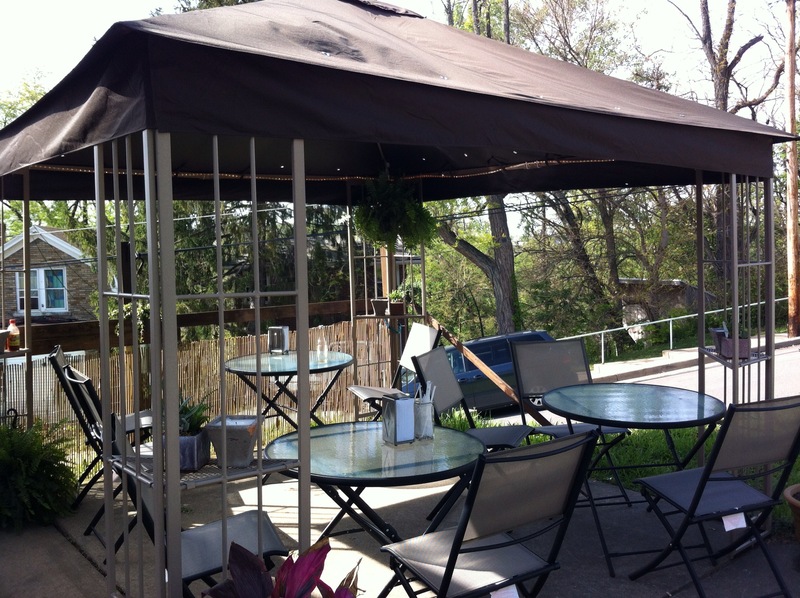 As far as the whole dining experience, I would give it to Casa Rasta based on the patio and option for outdoor dining. 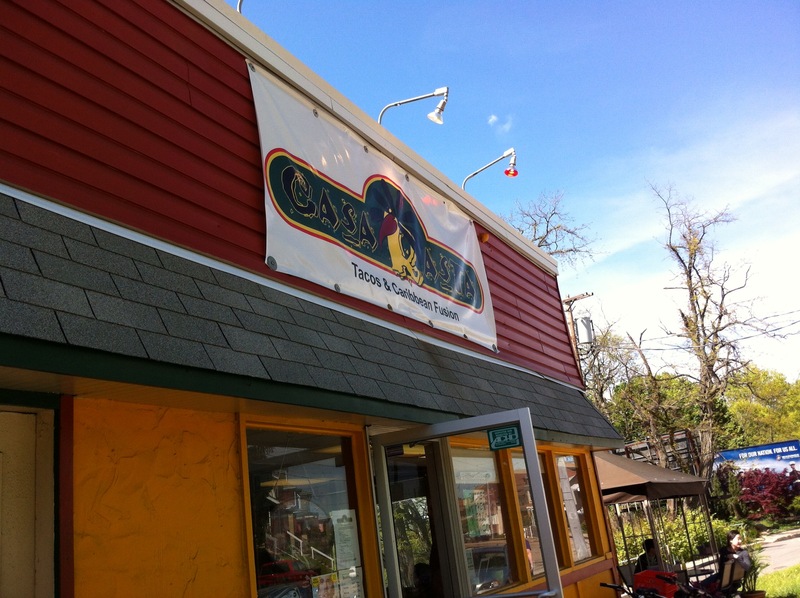 I would go back to Casa Rasta with friends for a cheap, casual meal. I would go back to Smoke time and time again for flavorful, fresh food. Smoke wins from a carnivore’s perspective as well – I liked Casa Rasta but some of the menu items just weren’t as spectacular as everything I’ve had at Smoke. I went to both with meat-eaters as well. Smoke got better reviews from them as well. Funkier menu and more ingredients. 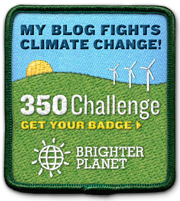 Really diggin your blog! I’m always on the fence about trying new restaurants, but it’s awesome to see this kind of a resource for veg-heads. Have you ever been to Joe’s Hot Dog Cart? He’s usually on CMU’s campus (if you keep going on Margaret Morrisson) or on Walnut St. on Saturdays. Veggie dogs, tofu burgers, tofu and basil sausage, all awesome. Anyway, keep doing what you’re doing, because it rules! Thanks! Funny you should ask about Joe’s. I had lunch there TODAY! No kidding! I work at CMU, so it has become a regular lunch destination for me. The Veggie Special (veggie dog, hot peppers, mustard, celery salt and tomato on a wheat bun) is my FAV! Thanks again for reading. It’s a blast trying out new places. Lemme know if you hear of any other good places and I’ll go check ’em out!